Kevin Ellis is a champion! 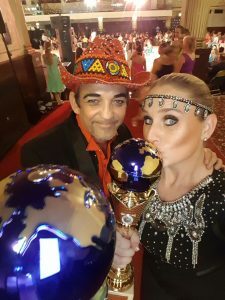 Pinetown-boy Kevin returned to South Africa as the reigning European and World, doubles and singles champion after competing in the 2018 World Dance Masters competition in Blackpool, England in August, and the European competition in Dublin, Ireland in March. His partner in the doubles category was Robyn Beck. Kevin’s speciality is line dancing but he is also the SA Cabaret champion and will participate in one more dance competition this year: Rumba in the Jungle at the Sun City Superbowl. dance pastime and doesn’t have to be competitive.’ It is also purported to cut back on dementia and as such Kevin teaches at a lot of retirement homes in the Durban area. He will soon be doing his first line dancing fundraiser for the Dementia Society in KZN. Great with people of all ages, this dance star is to be the host of the upcoming Umhlanga Tourism December festival and will be teaching beachgoers of all ages some of his moves. So, holidaymakers – you’re in for a treat! Kevin’s life is a whirlwind right now but the champ is likely to keep up his healthy daily regime of: dance practice, the elimination of sugar, cross training exercise, the intake of up to four litres of water, and plenty of sleep. Well done Kevin, and see you at Main Beach, Umhlanga, 14 to 23 December 2018! ← Say Yes to (Bamboo) Straws!